XING has recently decided to discontinue its official free API. Today we are introducing the better alternative – new NextScripts Premium API for XING. Unlike the API from XING that was able to make posts to profiles only, NextScripts Premium API for XING can post to profiles, company pages, and groups. UPDATE (Jan 20, 2017). Version 3.7.11 has been released to WordPress.org plugin repository. it has all code from this beta along with some fixes. Please update your plugin. New beta version is available for download. Two most popular networks Facebook and LinkedIn just got a completely new configuration interfaces. Just upload it to your plugins directory replacing current files or delete your current SNAP version install it from WP Admin. (That will not delete or anyhow affect your currently configured networks and settings). Since it’s a beta version, please make a backup before upgrading and please report any issues right away. SNAP for WordPress Version 3.7 has been released. This version adds support for two new networks. 1. Weibo. Biggest Chinese Microblogging Service. You can post your messages and images. 2. MailChimp. One of the most popular email marketing tools. You can send your blogs as email campaigns to specific subscribers. Version 3.7 also has cleaner and less cluttered interface for both settings and “new post” page, new “Post to all checked networks” button on the published post page, new categorized list of networks on the “Add New Network” page. Instagram Autoposting is coming to SNAP! 3 years ago we wrote an article explaining why Instagram was not supported. Instagram was accepting images only from the phones and other mobile devices and there was no way to post there from the website or API. Since then we were considering creating our own API for Instagram. Well, today we are announcing it. NextScripts API for Instagram will be available for all active API subscribers* Friday March 5, 2016 as part of the Universal API. Autoposting to Instagram is available to all active SNAP API subscribers. Active SNAP API subscriber is anyone whose last payment for SNAP API was less then a year ago. Clarification #2: Who is getting Instagram? Today we are announcing SNAP for WordPress Version 3.5. It will be released on Friday, March 4, 2016. This version is a result of our decision to change our release strategy. We are still working on completely new and totally re-written version 4. That version will be a major release and it already took a lot of time to develop. We realized that while we are sitting on some cool features that were made for upcoming V4, version 3.4 already got 32 almost featureless releases. We are sitting on them for too long. Some of those features require brand new V4 platform and engine, but some of them can be easily ported to V3 and work along with the old code. So we decided to make several smaller releases instead of keep people waiting for one big. We are starting with version 3.5 that got new API connection engine. New engine comes with highly optimized, smaller and faster V4 API connector files. We created a way for new API connection engine to seamlessly work with the old one. XING [Updated] (Free and Pro). Eventually all networks will be ported to new V4 API connection engine. Very soon we will make couple more V3 releases with new interface, features and networks and then, once we finish new autoposting engine, we will switch it on and call that release V4. That’s the plan. PS: We apologize to all people who are waiting for the new “existing posts re-posting” functionality. This feature actually requires new V4 posting engine and will be available only in actual V4. Version 4 is coming out soon. 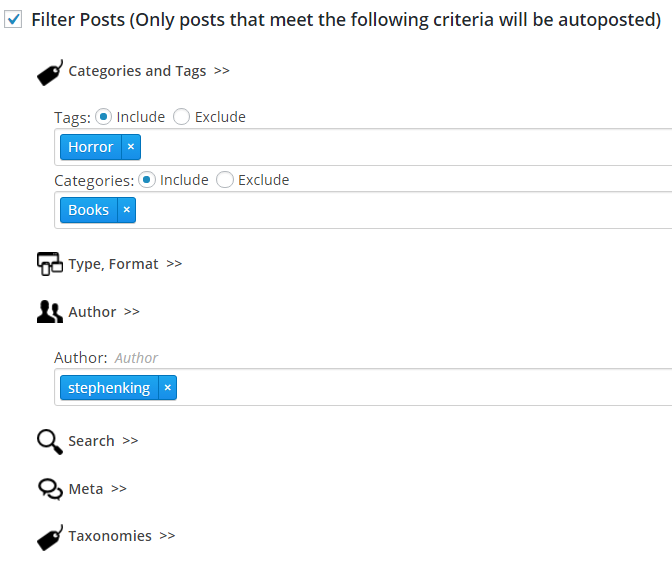 One of the new features is “Filters” – an ability to define exactly what posts should go to each configured networks. SNAP for WordPress Version 3.4.12 has been released. This version adds support for two new URL shorteners, ability to force shortened URLS as well as some bug fixes. Versions 3.4.x will be the last of V3 family. We already started working on the version 4, which will bring new interface and many new features including completely revamped “Old Posts Re-Posting”. Plugin outgrew it’s old place under the settings menu. SNAP is now located in the left menu column. Version 4 is coming out soon. One of the most important new features is a completely redone auto-reposting. – Auto-Repost only posts written by specific author. – Auto-Repost only “Image” format posts, not “Link” or “Standard”. Version 4 will use Reposter Actions. 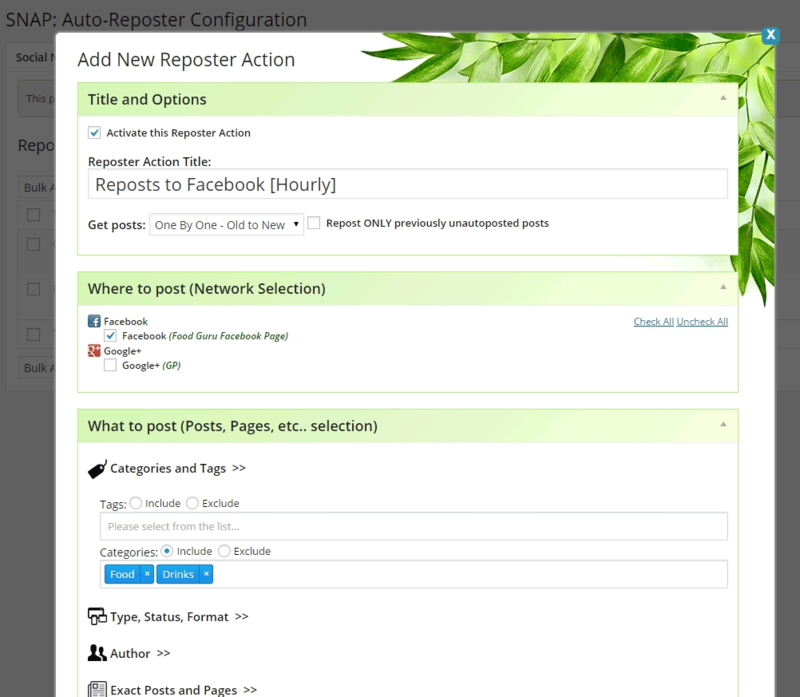 Each Reposter Action can be configured individually and you can setup what posts should be posted to what networks and when should it happen. Nice people from Yoast added SNAP to the list of incompatible plugins without any additional explanation. You can’t have more then one set of open graph tags on your site. Yoast SEO Plugin has an ability to add open graph tags on your site and SNAP can add open graph tags to your site as well. If you have both features active you will get two sets of open graph tags and that will confuse social networks that use open graph tags. You need to disable open graph tags in one of the plugins. SNAP for WordPress Version 3.4.4 has been released. This version adds new network XING, some performance improvement as well as some bug fixes. * New – New network “XING”. 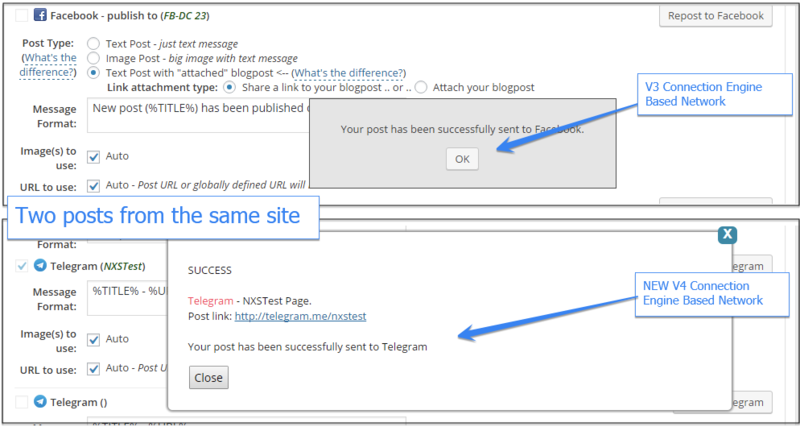 Post text messages or share links to your personal account. * Bug Fix – [Diigo] “301” error message has been fixed. * Improvement – Full WordPress 4.0 compatibility including fixed for all “depreciated” notices. * Improvement – Better handling of Twitter characters limit. * Bug Fix – “Verify Featured Image” checkbox in the settings tab was not working along with functionality it should turn on. * Bug Fix – “Filter posts by tags” was broken. * Bug Fix – Duplicate “Update Settings” button. * Bug Fix – [LinkedIn] ugly error messages. * Bug Fix – [Plurk] – missing token error. * Bug Fix – Fix for Broken Visual Editor. TinyMCE 4.0 compatibility broke earlier TinyMCE versions. Solution for disappearing “Pro” features and “Incorrect Activation Key” error. First off all we need to apologize to all the people who lost “Pro” features or got “Incorrect Activation Key” error during the last 8 hours. Last night our server got corrupted in a bad way. What happened is when plugin checked for a version upgrade instead of “No/Here is a New Version” response server was returning a corrupted page. Plugin assumed it’s a new version – “Pro” functionality got corrupted. The same happened to the new “Pro” activation requests. Instead of “Pro” features server returned some corrupted page causing “Incorrect Activation Key” errors. It’s all fixed now. Please re-enter your activation key and “Pro” will be back. UPDATE: Issues like “Can’t upload images” and “Broken Media Manager” are also related to this. 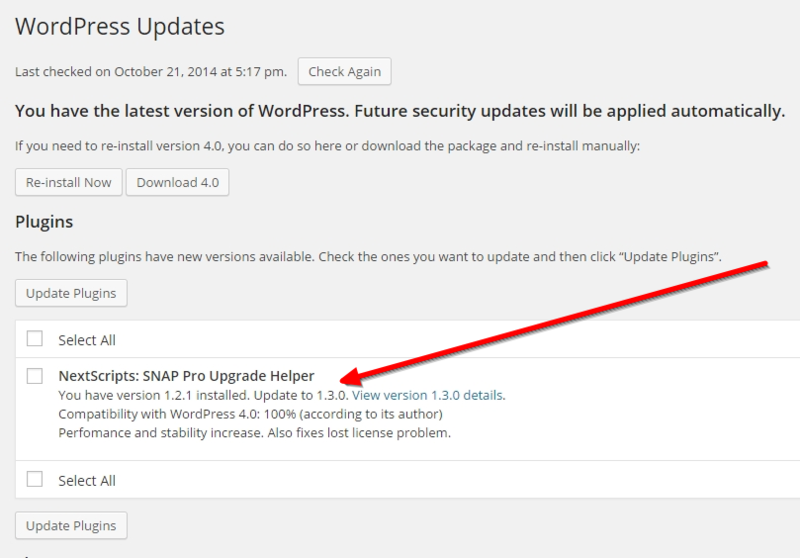 SNAP for WordPress Version 3.4.1 has been released. This version adds new network Kippt and support for WordPress 3.9 and PHP 5.5 as well as many bug fixes. * New – New network “Kippt”. Post your blogpost links to your Kippt Lists. * Improvement – Full PHP 5.5 compatibility including fixed for all “depreciated” notices. * Improvement – Full WordPress 3.9 and TinyMCE 4.0 compatibility including fixed for all “depreciated” notices. * Bug Fix – [Facebook] Fix for “Please make sure your redirect_uri is identical to the one you used in the OAuth dialog request” problem. * Bug Fix – [Facebook] Fix for posting to boards with international characters in URL. * Bug Fix – [Facebook] “Unsupported post request” error. * Bug Fix – [Facebook] Broken ability to post to the hidden groups. * Bug Fix – [Blogger] “Incorrect JSON” error. * Bug Fix – [Pinterest] Invalid log entry. “TEST”. * Bug Fix – [Twitter] Wrong codes (like —). * Bug Fix – [VK] Better support for phone verification. * Bug Fix – [SETT] Fix for “Please make sure your redirect_uri is identical to the one you used in the OAuth dialog request” problem. * Bug Fix – If you put 4 minutes in the dropdown for the Posting Delay, it returns 45 minutes. 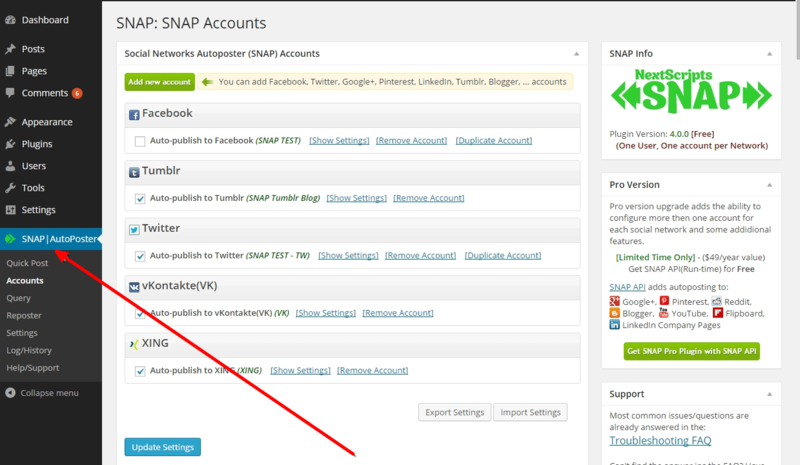 SNAP Plugin for WordPress – 1,000,000 downloads. 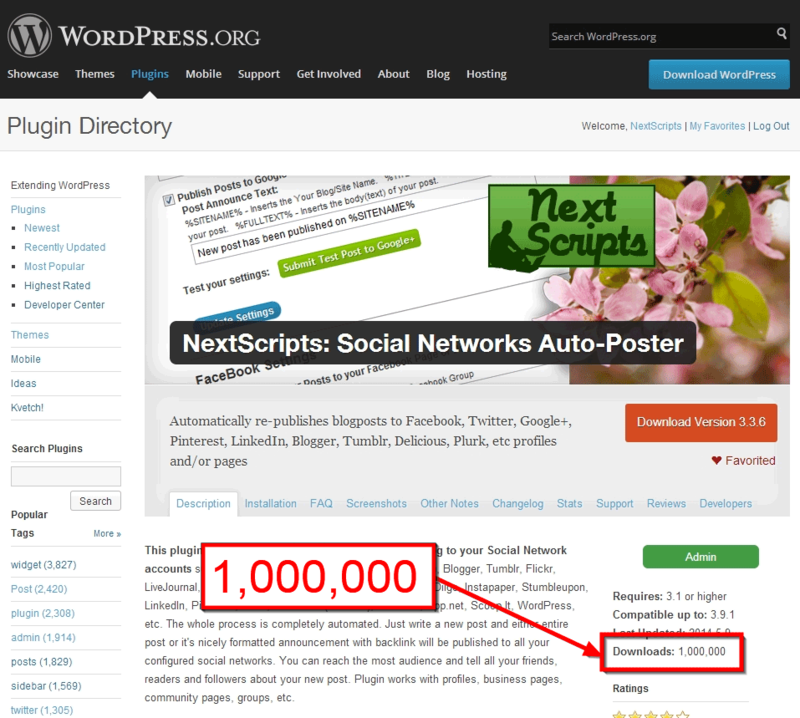 SNAP Plugin for WordPress just reached 1,000,000 downloads on wordpress.org. It happened today May, 11 2014 at 2:15 AM EST. What can we say? Thank you! You guys are awesome! Thank you for using our plugin, thank you for your good reviews, thank you for your bad reviews, thank you for reporting bugs and problems, thank you for encouraging us to add more features and improve the product. Thank you for your support. Also very special thank you to all people who bought the “Pro” update! We will keep working on it and we will keep adding new exiting features because of you. PS: Yes, we know those are not unique downloads, this number counts upgrades as well. PS2: Next 3 SNAP PRO Plugin for WordPress upgrade orders will be refunded, which means you will get it for free!